Epictetus (c. A.D. 55 - 135) was a Greek/Roman philosopher of the Hellenistic period. He managed to overcome huge obstacles in developing from a crippled Roman slave to become one of the most popular and sought after philosophers of his time. Epictetus (pronounced epic-TEE-tus) was born around A.D. 55 in the Roman city of Hierapolis (the present-day city of Pamukkale in south-western Turkey). He spent his youth in Rome as a slave to Epaphroditus, a wealthy freedman and secretary to the Roman Emperor Nero. He was either lame from birth or, as some sources have it, deliberately crippled by Epaphroditus. 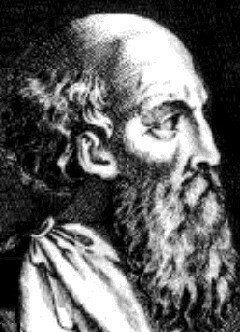 Even as a slave, he studied Stoic philosophy under one of the greatest Stoic teachers of the age, Gaius Musonius Rufus, before the latter's exile by Nero for his ethical teachings. He gained his freedom after his master was put to death by Nero's successor Emperor Domitian, and began to teach philosophy in Rome. Around A.D. 93, however, Emperor Domitian banished all philosophers from Rome (and ultimately from all of Italy), and Epictetus traveled to Nicopolis in north-western Greece. There, he founded his own philosophical school, which soon acquired a good reputation, attracting many upper-class Romans. His most famous pupil there was Arrian (Flavius Arrianus: c. A.D. 86 - 160), who studied under him as a young man and wrote the famous "Discourses" and the "Handbook" based on his lecture notes. He lived a life of great simplicity, with few possessions. He was reportedly a powerful speaker and famed for his knowledge and wisdom. According to some reports, he was more popular in his day than Plato had been in his, and the Emperor Hadrian (among other eminent figures) favored him and may have visited his school in Nicopolis. He never married and had no children, and for many years he lived alone, although in his old age he adopted a friend's child (who would otherwise have been left to die), and brought him up as his own. So far as is known, Epictetus himself wrote nothing, and all that remains of his work was faithfully transcribed by his pupil, Arrian around the years A.D. 104 - 107. The main work is "The Discourses" (of which four of the original eight books have been preserved), and a popular digest of that work, entitled the "Enchiridion" (or "Handbook"). The Stoicism school of philosophy had been founded nearly 400 years before Epictetus, and very little of the original works of Zeno of Citium and Chrysippus of Soli (c. 280 - 207 B.C.) has survived. Most of our knowledge of Stoic philosophy therefore comes down to us from Epictetus, although it is difficult to tell to what extent he preserved the original doctrines, and how much he innovated and adapted. Epictetus focused more on Ethics (and less on Logic and physics) than the early Stoics had, and he brought to a logical conclusion Stoicism's tendency to reduce philosophy to Ethics. He saw the role of the Stoic teacher as encouraging his students to discover the invariable and inviolable true nature of things. The nature of things falls into two categories: those which are subject to our exclusive power (e.g. judgment, impulse, desire, aversion, etc), and those which are not (e.g. health, material wealth, fame, etc). In order to achieve the ultimate goal of ataraxia (an undisturbed and serene state of mind), the philosopher should therefore concentrate on those things he has some control over, and not be affected by the external objects of our lives (over which we have no control). Essentially, then, Stoicism teaches the development of self-control and fortitude as a means of overcoming destructive emotions, in order to develop clear judgment and inner calm and the ultimate goal of freedom from suffering. The Stoics were essentially materialists, and God was conceived of as a type of fiery breath that blended perfectly with all other matter in the universe and transformed matter from undifferentiated "stuff" into the varied forms that we see around us. The mind of each person was quite literally a fragment of God, and the rationality that we each possess therefore a fragment of God's rationality. Living in harmony with nature, and accepting whatever fate brings were also important Stoics precepts. Epictetus argued that we can never fail to be happy if we learn to desire that things should be exactly as they are.